If you are new to Pittsburgh, or are just a casual Pirates fan – you may be wondering why everyone is walking around in an extra layer of black and gold. It is a BIG day in Pittsburgh. 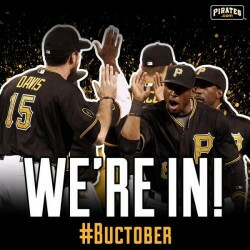 The Pirates play a postseason game tonight at PNC Park. I wanted to share the email that the Independent Brewing Company just sent out, which does an excelled job of explaining why the game tonight is a big deal. If you haven’t been to the Independent Brewing Company yet – GO THERE NOW! A great bar, located in the heart of Sq. Hill that only server local brew. If you can’t make it to the Independent Brewing Company RIGHT NOW, then take a moment to follow @IndependentPGH on Twitter. No. We’re not putting the TVs back in and renewing Fanattics’ cable subscription. Yes. We are going to play tonight’s Pirates playoff game, which we will stream to a flat screen television through my espn.com account. We stand by our position that televisions, for the most part, ruin good tavern experiences. And after tonight’s game, we will return to our televisionless tavern lifestyle. However, at the end of the day, if a newly-minted 21 year-old walked into the Indie tonight for her first legal beer, she would have witnessed exactly one season of Pirates playoff baseball in her life. These things don’t come around often. I’d like to think we’d televise another moon landing. Pirates playoff appearances are just as rare. Click here to read the entire email from the Independent Brewing Company Management. « Links N’At – What is the correct glassware for an IC Light?